The starting point for many developers using Solid Framework is the simple pdfcreator sample. This tiny program demonstrates the shortest path to creating PDF files from just about any document on a Windows system. The ShellPrintProvider uses Windows Explorer to launch the application associated with the file type you are trying to convert. This only works if the application in question supports the shell “print” verb. 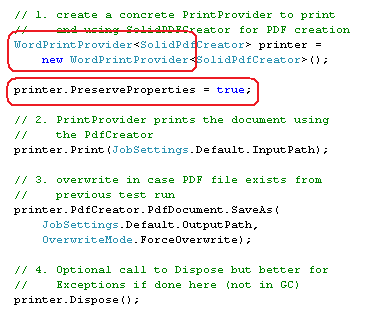 In addition, print providers can use any of the supported Solid Documents PDF creation printer drivers. 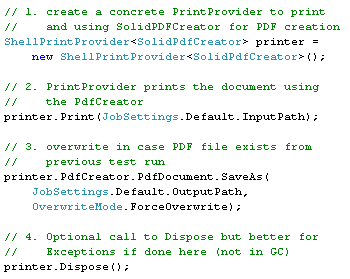 This example requires the Solid PDF Creator printer driver to be installed (but does not require a Solid PDF Creator license). 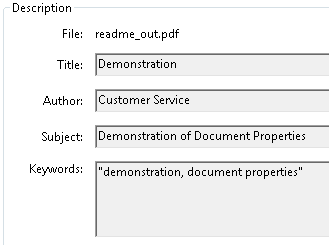 When you run the sample application and then examine File Properties for the resulting PDF file in Acrobat Reader you should see that your Document Properties from the original Word document have been preserved. 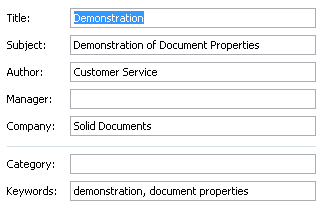 You should also notice a lot less UI “noise” from Microsoft Word during the creation process.